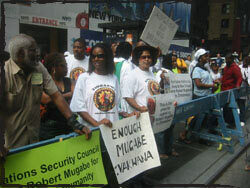 Anti-Mugabe demo in New York was a success. The Herald is a perpetual flop. Contrary to Munyaradzi Huni's diatribe in The Herald the anti-Mugabe demonstration was a success. 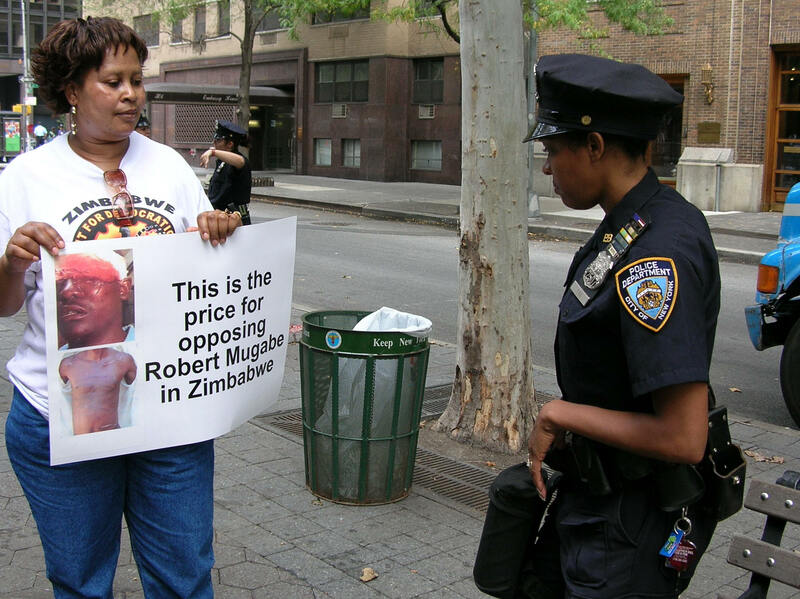 Over 50 Zimbabweans and their friends staged an anti-Mugabe demonstration at the United Nations Headquarters in New York last Saturday. Robert Mugabe was in New York attending both the United Nations General Assembly and the World Summit for Heads of State. 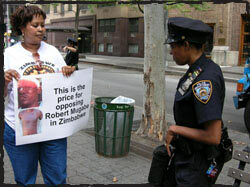 Anti-Zim Demo Reprinted from article posted by The Herald (Harare), Posted to the web September 19, 2005. Article by Munyaradzi Huni in New York. "An anti-Zimbabwe demonstration organised by a group calling itself Association of Zimbabweans Abroad was a total flop after only 10 people turned up at the venue opposite the United Nations Headquarters here on Saturday." the protesters were largely ignored by ordinary people and delegates who went on with their business. Plans to stage the demonstrations were announced some months ago by the group, but if the number of people who heeded their call is anything to go by, then the organisers of the demonstrations should know that they were wasting their time. The demonstrations were planned so that they could coincide with the UN World Summit and the 60th General Assembly that started here last Wednesday. Asked by reporters whether the demonstration had been successful considering the small number of people in attendance, one of the organisers Mr Stanford Mukasa, however, said the demonstration was a success. "Yes, we are happy. The demonstration has been a success. If this was Harare, police would have thrown teargas at us," he said. Pressed to comment further on the low attendance, Mr Mukasa said: "More people are coming. Some will come later." However, the venue was still deserted an hour later. It was clear from the beginning that the demonstration would be a flop as even the few protesters showed disinterest with some sitting under the trees. Led by Dr Handel Mlilo of the North American Coalition for a Free Zimbabwe, the protesters tried to sing anti-Zimbabwe songs but they just did not have the energy. "Free Zimbabwe now, Free Zimbabwe now" they faintly chanted and their voices were swallowed by cars that were driving by. The international media that the organisers thought would trip each other to cover their event was busy trying to secure an interview with President Mugabe. One of the demonstrators was putting on an MDC T-shirt and when this reporter tried to interview him, he disappeared into the streets. 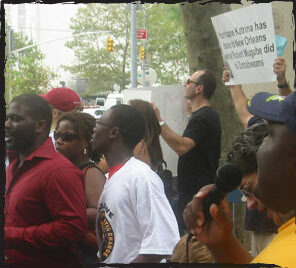 The demonstration was organized by the North American Coalition for a Free Zimbabwe (NACFREEZ). Earlier, NACFREEZ had sent a fax to former president Bill Clinton who was hosting the world leader's summit. In the statement NACFREEZ appealed to President Clinton to use his international influence to bring pressure to bear on Mugabe. However, the protesters never got to confront Mugabe because he was whisked away one hour before the protestors arrived. "Hurricane Katrina did to New Orleans what Hurricane Mugabe did to Zimbabwe." "Hurricane Katrina killed 500 people. Hurricane Mugabe killed over 30,000." "Robert Mugabe must be brought before the International Criminal Court for crimes against humanity in Zimbabwe." "The United Nations Security Council must indict Mugabe for crimes against humanity." Some of the protesters came from as far as Florida, Atlanta and Michigan. The protesters chanted "Mugabe must go." The demonstration began at the United Nations headquarters where Mugabe was attending a meeting. However, security at the United Nations buildings kept the protesters some distance from where the world leaders were. But some of the delegates passed by the protesters and read and saw the posters and banners. A member of the delegation from a country neighboring Zimbabwe stopped by. He was asked whether he knew where Mugabe was. The delegate said Mugabe was attending another meeting of world leaders at the Sheraton Hotel. He also told the protesters Mugabe was staying at Palace Hotel. Protesters decided to track down Mugabe. During the march to the hotel where Mugabe was protesters held their banners and posters. Hundreds of New Yorkers saw the protesters. Some of them shook their heads at the sight of pictures of the victims of Mugabe. One police officer was openly moved as she shook her head at the sight of Mugabe's victims. The protesters showed the world that a determined people can launch an effective campaign. A propaganda journalist for the Sunday Mail, Munyaradzi Huni, stopped to take notes. After they had identified him, the protesters who had been chanting "Mugabe must go" now also chanted "Sunday Mail and Munyaradzi Huni must go." I decided to engage Huni in a discussion about the propaganda journalism that he practices. Huni's argument was that human rights activists are trying to change things too quickly. He denied that he had not written critical stories about Mugabe in the face of a dilapidated state of affairs caused by bad governance in Zimbabwe. I asked Huni to give me just one example of a story he wrote that was critical of Mugabe, considering the very well-documented facts about Mugabe's brutality to Zimbabweans. He said he had written many stories quoting police statements, but he could not give just one example. At my suggestion he promised to send me by email the critical stories he had written about Mugabe. He said he was going to send them that night. It is now evening three days later and I have not received anything from him. The more he talked the more Huni revealed the journalistic naivete about issues in Zimbabwe. He claimed that when he did not write what activists wanted him to write they labeled him a Mugabe supporter. "Would you like me to call you an MDC supporter for criticizing Mugabe?" he asked me. One only needs to see what Huni has written: pure propaganda masterpiece eulogies for Mugabe. How can anyone not call him a Mugabe supporter when Huni has totally ignored Mugabe's blatant misrule? The fact that Huni was incapable of distinguishing between stories in praise of the MDC, if ever there were any, and those highlighting the acts of repression in Zimbabwe by Mugabe was glaring evidence of how low the standards of journalism have degenerated among the state media writers. Huni showed how he and his fellow journalistic disciples of Mugabe in the state-controlled mass media had now swallowed hook, line and sinker the view that whatever problem exists in Zimbabwe must be blamed on anyone but Mugabe. There is a psychotic culture among these propaganda journalists that if they publish anything about human rights violations, the killing of opposition supporters by Mugabe's thugs and destruction of people's property they will be labeled supporters of the MDC. And if they publish anything positive about MDC and the opposition movement in Zimbabwe they will also equally be labeled MDC supporters. Yet they do not want to be labeled Mugabe's supporters when the only journalism they know is that of unmitigated hymn sing in praise of their Great Leader Kim Il Sung Robert Mugabe. But it was not only Mugabe's journalistic disciple who visited the protesters at the UN. Another man who claimed to work for the local press came to take pictures. We later learned from our sources that he was in fact a member of Mugabe's dreaded CIO. Indeed we saw him engaged in a conversation in Shona with Munyaradzi once they were out of sight. The collaborative link between Mugabe's CIO and his disciples in the journalistic community is real and active. That link includes the police, army and the militia thugs. Mugabe must have heard from his sources that there would be an anti- Mugabe demonstration at the UN. He did not show up. He knew that without the protection of his militia thugs Mugabe is timid, helpless and a coward. Huni and his CIO compatriot who came to take pictures and notes about the demonstration must have seen how the rule of law is respected outside Zimbabwe. Police were at the demonstration to maintain order and protect the demonstrators. Had that protest been held in Harare the protest would have lasted a few minutes before it was broken up by Mugabe's ruthless police and militia thugs. The anti-Mugabe protest movement in the United States is gaining momentum. With a new no-nonsense assistant secretary of state for Africa, Mugabe is in for a rough time in the coming years. Huni's article in The Herald was a classic example of the propaganda journalism of the state media writers. In propaganda journalism one tends to see what one wants to see in order to please his masters. This is the way Huni approached the whole story. Just to set the records straight. The organizers of the demonstration did not want to talk to him. They said whatever they said was going to be distorted by Munyaradzi's brand of propaganda journalism. I only talked to him out of curiosity about how the mind of a propaganda journalist functions or malfunctions. It was the kind of curiosity spectators have of a monkey in a circus. I did not expect anything serious to come out of him. Propaganda journalists are very fanatical about their masters whom they are sworn to protect and defend at all costs. The only significant thing to come out of this encounter with Munyaradzi Huni was he had become a case study for me about the psychosis of a propaganda journalist. He helped me confirm theories of how a propaganda journalist functions or malfunctions. He called the demonstration a flop. What he did not know or refused to know was that the UN demonstration was part of a wider anti-Mugabe struggle that has so far succeeded in isolating Mugabe. Huni's boss, Mugabe, is increasingly becoming isolated. US assistant secretary of state announced on the same day at the United Nations that the US was tightening its sanctions regime against Mugabe and his top officials in government and ZANUPF. The European Union is also tightening its sanctions regime against Mugabe. These were precisely the objectives of the protest at the United Nations. Yet Huni calls the protest "a flop widely ignored by ordinary people." Of course Huni chose not to see all the New Yorkers who actually stopped by or saw the posters denouncing Mugabe. 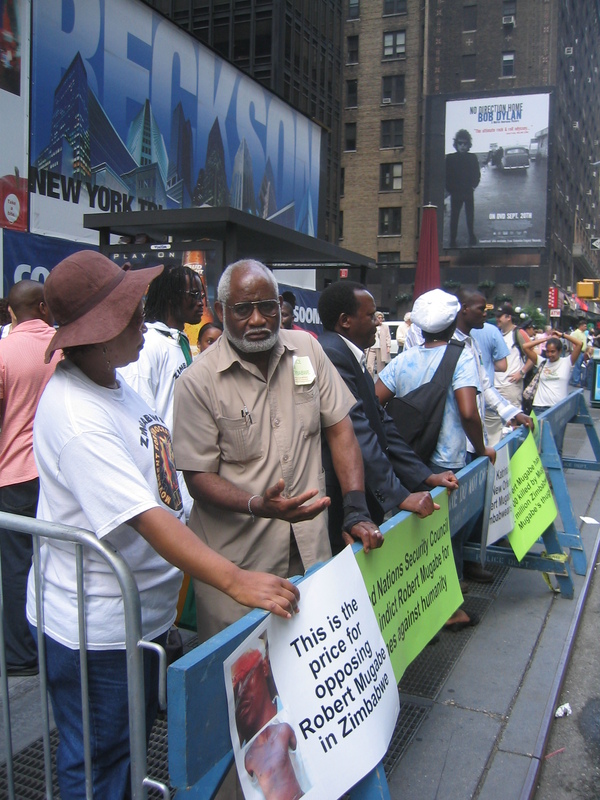 Huni was of course not aware the demo did not only take place outside the United Nations but proceeded several blocks to the Sheraton Hotel and through the period the demonstrators were in town hundreds of New Yorkers were exposed to the demonstrators' message. In contrast, The Herald and the state media fanatical defense of Mugabe and ZANUPF has not improved the situation at home. Neither has it improved the image of Mugabe abroad. Those international journalists that Huni pompously claim were only interested in interviewing Mugabe are exactly the same who are spreading far and wide around the world the message of the humanitarian crisis in Zimbabwe caused by Mugabe! This is why international correspondents have had a tough time in Zimbabwe! Zimbabwe is now a basket case – over 4 million Zimbabweans face starvation.